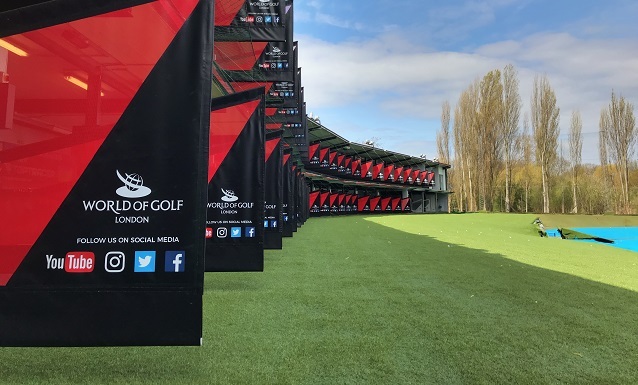 World of Golf London is the busiest multi-purpose sports driving range facility in Europe with 60 bays across two tiers located in South West London, England between Wimbledon and Kingston on Thames. Top Tracer technology is installed on 32 inch TV screens on each individual bay across the whole range. There are ten dedicated golf teaching professionals in The Performance Centre aiding those of all levels from beginners to those who have been playing years. World of Golf London offers the biggest Learn to Play programme in the world. Starting with six free beginner lessons in group classes new players move on to improver classes and then are introduced to on-course play at local partner clubs with the help of Kevin, our in-house beginners teaching specialist. American Golf is a named partner within the range and have one of their biggest superstores in the UK co-located with the driving range. World of Golf London also operate on site a Costa Coffee franchsie which serves everything from hot meals to alcoholic beverages throughout the day and evening, inside and outside. There is an 18 hole Jurassic Adventure Mini Golf course with interactive dinosaurs as well as a new children’s Party Room. Free Parking is available all day as well as a car cleaning service on site. Brand new fully serviced offices are also available on the site for our golf-loving clients on short term contracts which boast fully functional fob system interactive door entry, a fully-furnished kitchen and lounge area, a meeting /large boardroom with interactive television as well as all inclusive services such as wifi and free parking.